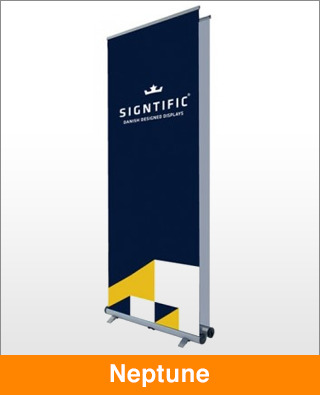 The Signtific Neptune 42 has all the advantages of any signtific banner stand, TWICE in one package. Twin interchangeable cartridges and magnetic leaders allow you to change either or both of the graphics instantly with no fuss. Hinged feet give that extra needed support for two graphics whilst still allowing the stand to be compact and easily portable in a padded zip bag.